Nu Image/Millennium Films have officially announced a greenlight for Rambo’s fifth mission, with Sylvester Stallone signed on to return to star and also direct. No word on if Stallone will also write this latest adventure, but I would say it’s a strong possibility considering that he wrote the screenplays for the previous films. So what is the new movie going to be about? 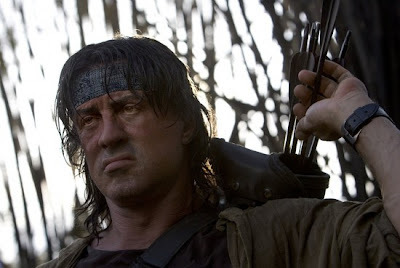 According to Variety, Rambo will fight his way “through human traffickers and drug lords to rescue a young girl abducted near the U.S.-Mexico border.” Doesn’t sound like the big departure that Sly had previously promised (but then again, he also said that there would never be a fifth Rambo film). Now that I've got that out of my system...THEY'RE MAKING ANOTHER RAMBO MOVIE!!! Every bit of respectable cineaste and thoughtful film critic in me is saying this is a horrible idea and that there is no point in this...but who am I kidding? I love Rambo, I loved the last film, and I am WAY more excited about this than I should be.